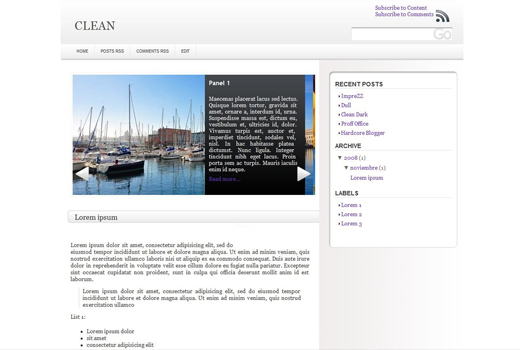 Clean blogger template for free download on Blogger Templates. can i know how to change or add picture in Panel 1 etc? Just click on Download button above. Would LOVE to know how to change the photos and text in the panel. Is this something we need to do in HTML, or is there a tutorial somewhere? Thanks much! It’s a great looking template and I’m looking forward to using it if I can figure out the photo panel things! I am afraid the photos and text in the panel have to be changed via html. They are not dynamic. They are static. However your blog is using wordpress, this template is only for blogger. You can use it? To change the photos and text in the template, go to your blogger platform, -> “Layout” -> “Edit HTML” and then do a CTRL + F search for panel 1 , panel 2 up to panel 5. There you can see the html codes to change the photos and text. I believe you can add more panels to it as well. I am still having trouble changing the photos. I have even tried reinserting the default photo from website but still no luck. Please explain it to me like I am a two year old. Is it an option to display date on the main page with each post? h5 tag was set for display:none so there was no way is was going to ever show. how can i make the comments appear? how can i erase the black panel on the pics? your template is nice, but can how do i put a link on “read more” onpanel slideshow? i think it’s would be nicer if the ‘read more’ link works. Awesome template! I love it. Just updated my blog with it…still have to work out a few things with my layout but I love it. My previous template was very cutsie…not that that’s bad but I was wanting something a little more professional looking. Thanks for the info on how to change the photos. Again, I love this template, very easy to work with and has an excellent look. Good work. How can I make the comments appear in the main page? Thank you very much! Really good template. The ideas you discussed here are really precious. Rrt had been such a pleasurable surprise to see that awaiting me once i woke up this very day. They are constantly to the point and simple to learn. Thanks a lot for the valuable ideas you have shared above. Does anybody know how to add header ?